The myth of dominance and the alpha dog – not true! Growing up in the ’70s and ’80s, we were taught by the experts of the time that dogs needed to be in a pack, and that it was important for the human to be the “alpha dog” in that pack. The human had to be dominant, or the other dogs would perhaps try to dominate you. You had to keep them submissive. We were taught to roll the dog on its back to make it submit. We put choke collars on and pulled as hard as we could. Well, if you look at the hairstyles we had then, you can tell we weren’t exactly on top of our game in terms of judgement. Turns out, the whole idea of the dominant alpha dog is a bunch of crap! So how did we all come to believe this myth? Well, people were convinced the world was flat for a while too, so hey, we’re always learning! The notion came from a paper published in 1947 by a behaviorist named Rudolph Schenkel. He observed the behavior of wolves and drew conclusions. Problem is, he was doomed from the beginning based on the study design. The wolves he was studying were not an actual pack. It was a collection of wolves that had never met each other. They were taken from zoos (high-stress environment) and thrown together into the arena where they were to be studied. So instead of studying an actual wolf pack, it was like MTV’s “The Real World.” Yes, there were fights. Throw a bunch of stressed-out strangers into a new, stressful situation, and see how they all get along. The TEN wolves were held in an area 10 meters x 20 meters. That’s a little under 2,200 square feet. Now think of the wolves in Yellowstone roaming acres and acres. The wolves in the study were in extremely close (and un-natural) quarters! I’m not knocking Rudolph. He was doing this in the 1930’s and ’40s. During this era, Penicillin was the new hot discovery, and scientists were still trying to figure out how exactly to make and use it. Science has come a LONG way since then! Here’s where you can download the English translation of his paper. 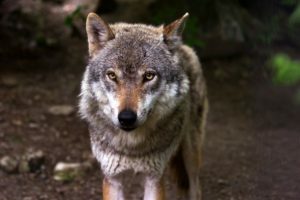 So Rudolf Schenkel’s paper started this notion of there being an alpha dog that ruled with an iron fist, but the flames were fanned in 1970 by L. David Mech, in his book “The Wolf: Ecology and Behavior of an Endangered Species.” He discussed and expanded on the notion that wolf packs need a dominant alpha wolf, usually a male, in order to keep law and order. Now we know that entire theory is wrong. There is no alpha. Over the last 30 years, studies on wolves in the wild, in naturally formed packs, with adequate space to behave as their instincts told them, demonstrated time and again this theory was fallacy. No study gave this theory any support. The evidence has been overwhelming. What took so long for us to get the message? Well, anything that has been ingrained for years and years (generations, actually) is an uphill battle to undo. We now understand that wolf packs use a “division of labor” approach – a team effort, if you will. Makes sense really. Why use time and energy for fighting? L.David Mech, author of the 1970 book, has been requesting the publisher stop publishing his book for years, due to its inaccurate material. He knows the alpha dog notion is antiquated and is trying to educate people! He also concludes “Dominance displays are uncommon except during competition for food.” Here’s the paper in its entirety. It’s not just him! In 2004 the Journal of Applied Animal Welfare Science published “A fresh look at the wolf-pack theory of companion-animal dog social behavior” by Wendy van Kerkhove. Following this article were several commentaries and articles that built on it. Here’s the kicker – so far we’ve talked about wolves, not dogs!!! Yes, dogs are descended from wolves, so there can be similarities. Many veterinary behaviorists draw from wolf studies to gain insight into dog behavior, and vice versa. However, your dog is not a wolf, and your cat is not a tiger (no matter what he claims). For years trainers told dog owners how to dominate their dogs, and to be the pack leader. Physical punishment was the basis. We all screamed “NO” at our dogs. Pinch collars and choke collars were the norm. Shock collars came about and were praised. Dogs were hit, shaken, and rolled, all per the recommendations of the trainers and “experts.” We thought we were doing it right. We were the alpha dogs! Scared dogs became more anxious, some even aggressive. Untold numbers were euthanized or dumped in shelters due to their behavior issues. It was not a good time to be a dog. We were also taught that multi-dog households were a “pack.” There would be a distinct alpha dog that fought its way to the top. The others were all subordinate. We were taught to feed that dog first, give it first choice of bedding, let it out the door before the others, etc. We had to reinforce that dog as being alpha, or there would be trouble. So if we are not the alpha dog, and our dog doesn’t need to be submissive to us, what do we do? If there is no alpha dog, how does our “pack” maintain order? It’s about respect, communication, love, and rewarding desirable behavior. Among dogs, there are individual variations in personality, but no fighting for the top spot. Some dogs are more outgoing, some are “clingy”, some are more independent, and some lack confidence. All will thrive in an environment based on working to earn rewards. In the early 1980s a veterinarian named Ian Dunbar published a book on dog training that was not the punishment, dominance focused style everyone else had been using. He focused on telling the dog what TO do, as opposed to what NOT to do. He also helped grow the concept of rewards integrated into training. Also, the concept that we are people and dogs are dogs was raised. It’s sad we had to have someone remind us of that! This was paradigm shifting for the time, and didn’t exactly change everyone’s minds. Fortunately, after that, the ideology began to (slowly) change. Many more behavior researchers and specialists emerged, all with the same theory – animals learn better when rewarded for good behavior, as opposed to living in fear of punishment. Karen Pryor, a marine biologist, extrapolated dolphin training techniques to dog training. Clicker training was introduced to the world. “Positive reinforcement” became a commonly understood term. 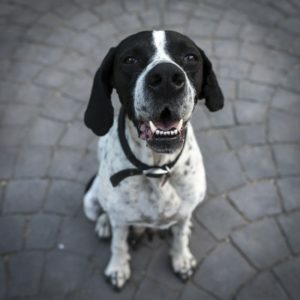 Other behaviorists published research and books, such as Dr.Karen Overall, Dr. Patricia McConnell, and Jean Donaldson, to name a few, proving time and again that dominance and punishment-based training are cruel and ineffective, while positive reinforcement training produces more consistent results. It took expert after expert, study after study, to undo the work of a single 1947 paper! In the veterinary world, there was minimal behavior training for veterinarians until only recently. While specialties like internal medicine, cardiology, surgery, etc existed for decades in the field of veterinary medicine, it was not until 1993 that the specialty in behavior medicine was accepted. Now there are numerous veterinarians who underwent further study, in the form of a residency, to become behavior specialists all across the country! Sadly, anyone can call themselves a behaviorist. There are many online classes to take, pay your fee, and get a certificate granting you the title. If you have a pet that truly needs help, these people are in no way qualified to help you. The best option is a veterinarian (a doctor!) who specialized in behavior. They are the only ones who can legally diagnose conditions, and treat them. Here’s a link to the American College of Veterinary Behaviorists. Or, see if the person you’re considering has the letters “DVM, DACVB” behind their name. So if your dog is misbehaving, he isn’t trying to be dominant. You don’t need to roll him over. Or growl at him. You need to tell him what TO do, and reward him. This article is not meant to be a primer on dog training, but an explanation of how we fell into the mistake of dominance theory, and that we’re now past it. Many of the sites I linked in this article are great resources for details on rewards-based training. Keep in mind – if you’re shopping for a dog trainer, and they immediately put a pinch or choke collar on your dog, or recommend a shock collar right off the bat – run! There is a small subset of dogs (teeny tiny subset) for which these are effective, but if these items are your trainer’s “favorite” tools, find a new trainer. Also, if they talk about dominance and alpha dogs, run away from the 1940’s! And yes, ingrained mindsets are hard to change. I was raised in the 70’s and ’80s to believe I had to be the alpha dog, and there was an alpha among my pair of dogs. Knowing the current theories and methodologies, I’ve been evolving my habits for years, but it can be hard! I still find myself on occasion inadvertently reverting back to that style of training, and I have to catch myself. So if you slip up, you aren’t a bad person. We all were mis-informed for years – no one’s fault, just the science of the time. However, now is the time to reject the outdated, incorrect theories and methods. Eschew those who are stuck in the abusive, punishment-based pattern, and move forward. Learn about rewards-based training, positive reinforcement, or clicker training. Your dog will be so much happier – as will you! At best, the show is entertaining but misleading to pet owners. At worst, Mr. Millan’s techniques and misinformation have contributed to increased aggression and anxiety or resulted in physical injury to the pet and/or pet owner. As practicing veterinarians, we all unfortunately have seen many cases of the latter. Merial claims to “enhance the health, well-being, and performance of animals.” The use of Mr. Millan as part of an advertising campaign speaks otherwise. In these difficult economic times, it may be understandable that Merial would want to use a “celebrity” to advertise its products in a direct-to-consumer fashion. However, had Merial taken the time to investigate, it would have found that Mr. Millan’s philosophy runs counter to the standard-of-care promoted by veterinary behaviorists and taught at veterinary schools. We are deeply saddened that Merial’s executives are not more supportive of the veterinary behavior community and its efforts to promote knowledgeable, scientifically-based, humane training methods. We remain concerned that your company’s support of Mr. Millan’s controversial training methods through the distribution of his video and financial support of his show will contribute to the number of difficult dogs and injured owners that we have to eventually console, counsel, and reeducate. Perhaps Merial would like to support our efforts to counteract the negative impact of this unfortunate marketing choice that may ultimately serve to alienate educated veterinarians, dog trainers, and owners alike. to reinforce the idea in humans to accept the rule of the human male alpha? Making it seem like it’s nature. Kind of like basing the calendar on Christ strengthened the sense that Christianity is real. Saying other species need to be dominated by a male strengthens the Illusion that we need the same. It makes it seem natural. Right. Really it was forced culture. That’s such an interesting point…and considering the era in which it originated, makes sense.